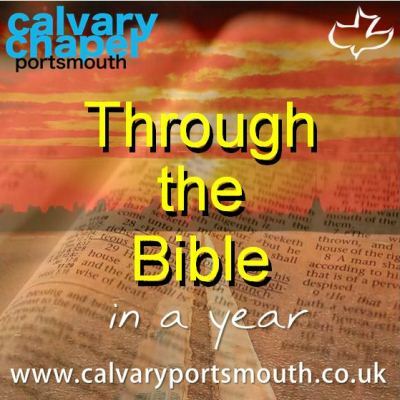 This study, taught by Pastor Barry Forder, is the 46th session of our ‘Through-the-Bible-in-a-Year’ series recorded during 2014 as part of our Sunday morning family services. In this study we review John’s letters and the letter from Jude. 7) Those born of God vs. all others. The basis of our walk with God is Love. We love because God first loved us, and we can love each other because of that love. John reminds us that relationship is the key. It has long been debated who the intended recipient was for John’s second letter. Some have tried to make ‘the elect lady’ a title of the church; but that falls down because she has children & a sister – hardly a fitting model for a ‘chaste virgin’ (2 Cor 11:2). The most plausable answer is that it was Mary. Mary was indeed elect, having been the chosen vessel to bring Christ into the world; and we know that John was intrusted with caring for her (John 19:26). John opens by expressing his love and joy that this womans’ children were walking with the Lord (we know that James and Jude did not believe until after the resurrection). John then focusses on the love that should characterise us, before warning of false teachers who were denying that Jesus was God in the flesh. John says in effect, ‘don’t listen to these people’. If Mary was the recipient, it is no wonder that John seeks to protect her. A key for all of us is v8 – see that we don’t loose our rewards, so remain faithful. John’s third letter bears similarities to his second in some ways. It is very personal in character, and it carries the same theme of truth. Truth again is presented as all-important. When truth and love come into conflict, truth must survive. Walking in truth is all-important. In the second epistle, John says that the truth is worth standing for, but in this third epistle, John’s emphasis is that the truth is worth working for. Someone has put it like this: “My life in God—that’s salvation. My life with God—that’s communion and fellowship. But my life for God—that’s service.” This epistle deals with my life for God, and it has to do with walking and working in the truth. Love can become very sloppy; it can become misdirected, and it certainly can be misunderstood if it is not expressed within the boundary of truth. Jude may only be a little one chapter book, but it is a heavyweight in content. Although Jude was a ‘half-brother’ of Jesus, he doesn’t dare to presume such a title, but rather introduces himself as the ‘servant of Jesus and brother of James’ (v1). Whilst Jude expresses his desire to ‘write of our common salvation’ (v3), he is compelled to exhort us to ‘contend for the faith’ (v3) on account of ungodly men that had crept into the church. He compares these ‘tares’ to the rebellious angels (in Gen 6) and the wicked men of Sodom and Gomorrah (Gen 19). We know from Matthew 13 that we are not to uproot these tares, lest we damage the wheat in the process – that is God’s business – but Jude has no hesitation in exposing them and their methods. It is vital that we are aware of their schemes, so as not to be deceived, but we must not become obsessed with them: “But ye, beloved, building up yourselves on your most holy faith, praying in the Holy Ghost, Keep yourselves in the love of God, looking for the mercy of our Lord Jesus Christ unto eternal life” (20-21). May this overview prompt you to undertake your own study of these divinely inspired books. The PDF slides are from the PowerPoint presentation used during the teaching session. You can listen to the audio on this web page, or save it for later listening.